Okay, so it’s a given that we all love our kids. They drive us nuts but we love them to death. Hopefully you tell your kids you love them a couple of times a day. When they leave for school in the morning and when they go to bed are probably the two biggies. Sure you say the words but do you know why? Do you know why you love your kids besides the fact that they’re you’re kids and that’s what you’re supposed to do? Think about it. We say the words all the time, but have you ever said to your child, “I love you because…” I know I don’t. That’s why I found a particular project interesting. 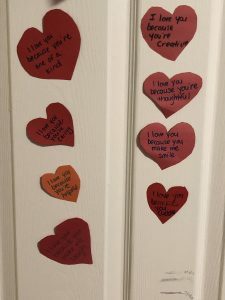 Basically you cut out paper hearts and write something positive about your child for the first 14 days of February leading up to the big heart day…Valentine’s Day! There’s a number of ways to do this, but I chose the “I love you because…” and filled in a reason each day. At first my kids thought I sniffed the glue gun too much and didn’t quite know what to make of mommy’s new project. “What are you doing to our doors?” they asked at first with skeptical looks on their faces. But, when I explained what the project was, they smiled. “That’s cool. 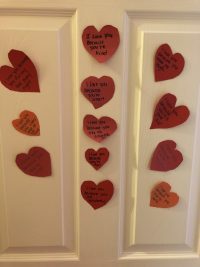 So everyday you’re going to put a heart with something on our door?” my oldest daughter asked. OMG! They actually liked it! I haven’t lost them yet! One point for Mom! So, for the past 13 days, that’s just what I’ve been doing. The first couple were easy. But, honestly, it’s been getting hard to come up with 14 unique reasons why I love my kids. I know that may sound horrible but when someone asks you to actually think about it, it’s tough! Not find new “Elf on the Shelf” hiding places tough, but tough in its own regard. Despite the challenge, I have to say I’ve really enjoyed doing it. It really made me think about what it is about my kids that’s so awesome. I think it’s a great confidence builder for them too. So many times they hear so much negativity in the world that it’s comforting to know they can find happiness and positivity in these little hearts. They can know what it is about themselves that makes them such wonderful kids. It’s something I think they truly internalize and remember. Although this little “heart attack” is over tomorrow, I’m going to make more of an effort of telling my girls the little things that make them big stars in my heart everyday, not just the first 14 days of February.